As a jewellery designer, my aim is to create beautiful pieces that express my love for storytelling. After working almost two decades in the jewellery industry, I have learnt the importance of scale, perspective, colour and form. My personal style celebrates feminine beauty ...with an edge, that gives my work an androgynous feel. As a creative, I believe jewellery is talismanic… where every piece is unique in nature… and carefully measured by instinct! I design to empower and celebrate! This stunning Smokey Quartz (8.60cts) from O'Briens Creek, Queensland is set with fierce 18k yellow gold arrowhead claws, an 18k white gold scalloped bezel and a rounded 18k rose gold band. She is armoured with fierceness, as she awaits her new Queendom! This stunning one off design has been set with a uniquely cut trillion cut parti sapphire from Central Queensland. With shimmers of chartreuse, olive green and peacock blue, this divine ring needs to be seen to believed! My 'Warrior Princess' ring is set with four gorgeous cognac and champagne diamonds from the Argyle mines in Western Australia. I created this stunning piece to honour the fighting spirit of a woman who knows what she wants in this life. Diamonds total 1.09ct set in 18k white and rose gold. This stunning cushion cut parti sapphire (3.43ct) set in an 18k yellow gold bezel and 18k rose gold band shone beautifully with colours of teal, olive and chartreuse. Her magic is in her simple beauty! My 'Cushioned with Spheres' ring, has been set with a four square brilliant cut PRASIOLITE (25.14ct) in a 9ct white gold bezel with 9ct rose gold solid ball tassels and band. 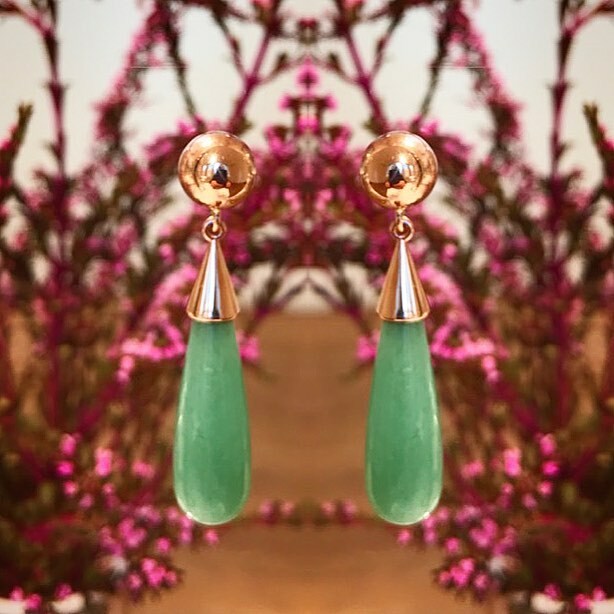 Each magical 'orb' tassel moves delicately around this stunning prasiolite when the ring is in motion, as a way of celebrating the sensual movement of a woman. Inspired by the honey colours in this citrine, I named her after Amaterasu, the Shinto Goddess for Sun and Universe. Citrine (Origin: Brasil) 11.64cts set with 18k yellow gold claws, 18k white gold bezel and an 18k rose gold band. The Amazon ring features a magical citrine from Brasil measuring 5.71 carats set in an 18ct yellow gold bezel and 18ct rose gold band. Cut in the shape of a 'shield', I designed this ring for the modern warrior woman who understands WHO she is and is willing to fight for her truth. My gorgeous Japanese Fan ring has been set with a carnelian measuring 17.29 carats. I commissioned master gem cutter Doug Menadue to facet from the rough, this unique shape. It has a lovely white gold cage and rose gold band to contrast beautifully with the burnt orange yumminess! Lastly, my dearest friend and crafts'woman'... Erin Timony added very fine engraving to this gorgeous piece! This stunning one of a kind 'Peacock' Ring was inspired by the power and beauty of the feminine spirit! She proudly wears in her rose gold feathers gorgeous lilac and violet sapphires (0.75ct) from Lava Plains, Queensland, a magical parti sapphire (0.55ct) from Central Queensland and brilliant cut 'conflict free' diamonds (0.14ct-G-SI) from Africa. Hand engraved by Erin Timony. Inspired by the Pacific, Indian and Atlantic oceans these three sapphires represent the surrounding seas from which I live on this planet. This lavender grey spinel had me at 'hello'. One of the most gorgeous gemstones to have crossed my path, I decided to not OVER design this ring and keep her innocently simple. Spinel (Origin: Brasil) 2.10cts set in an 18k white gold bezel and 18k rose rose gold band. When I was in Japan, I discovered Shinto where they believe everything in nature from mountains to the sea, have the spirit of our ancestors. This beautiful smokey quartz is the perfect example of this belief. Spherical facets by Doug Menadue. Smokey Quartz 15.71ct from O'Briens Creek, Queensland set in 18k yellow, white and rose gold. The Blue Temple is set with a stunning London Blue Topaz measures 19.90 carats. Sourced in Brazil, this beautiful stone was cut from a raw piece of stone by the uber talented gem cutter, Doug Menadue. The third stone ever cut in this shape, this Portuguese Rose Cut has been uniquely set upside down for optimum beauty. I have set her in 18ct rose gold and 18ct white gold. She needs to be seen... to be believed! The Voyage ring is inspired by navigation. With its compass-like claws, the quartz looks like a coral reef under a clear watered ocean. I picture stories of seafarers navigating rough seas to find treasures in the ocean and land. Quartz with calcite (83.60cts) set with 18k rose gold claws and 18k white gold. To honour the power and beauty of the feminine, I created this undeniable QUEEN called 'The Magic of Venus'. This gorgeous lemon quartz (44.90cts) is set with six 18k yellow gold arrowhead claws, 18k rose gold and solid 18k white gold tassels. Australian Chrysoprase set in 9ct rose gold. These earrings were part of my PEACOCK series where you can mix and match every component. From rose gold tassels to various gemstones these earrings are vey versatile. These gorgeous square opals (7.55cts) from Bulgroo, Queensland took my breath away when I first saw them! I decided to set them on an angle and hang magical tassels off of them so as to create a soft and feminine feel to them. 'NICA' Earrings (2nd design in the Badass Female Warrior series) 9ct white gold bowl with 9ct rose gold solid cone tassels and 9ct rose gold shepherds hook. NICA is short for Pannonica de Koenigswarter, whom in history was known as the 'Great Baroness of Jazz' because of her advocacy for black musicians in New York who suffered horrible racism despite their musical genius. These gorgeous rose gold hand engraved SINGLE PEACOCK earrings hanging on 18ct yellow gold studs were part of my latest collection. These were hand engraved by craftswoman Erin Timony. Joining my 'Badass Female Warrior' series as part of my Smokin Mama Collection, these have been named after one of the only known female samurai's in Japan who mastered the 'naginta'. Although Nakano Takeko was shot in the chest despite mastering the samurai, her dying wish to have her severed head buried so it didn't end up in enemy hands...was honoured by her sister. To this day, young girls celebrate her and the Women's Army every year during the Aizu Autumn festival beneath a pine tree at Hoikai-Ji temple. These stunning opals (47.65cts) are from Bulgroo, Queensland set in beautiful 9K rose gold. 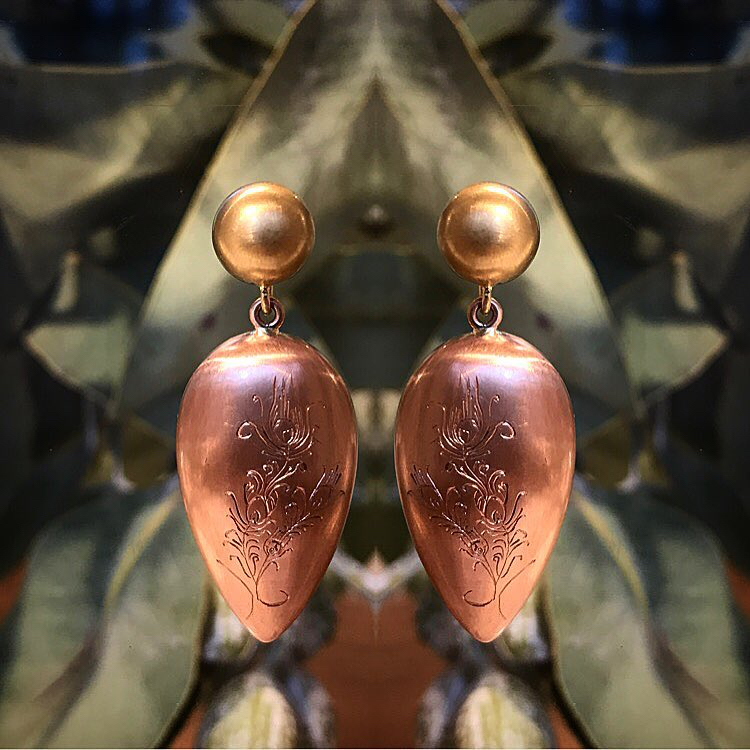 The metamorphosis of life is continuous as we develop and grow throughout the years, so I decided to create these magical 'Chrysalis' earrings to celebrate change... which is absolute! These gorgeous Australian Boulder Opals (7.10cts) from Bulgroo, Queensland have been beautifully set in 18ct white gold. I decided to keep the setting very simple because opals in my opinion have often been OVER designed! These beauties have been photographed with my detachable 9ct rose gold studs.... where each piece is sold separately. They have been designed so that you can change each component depending on your mood and energy that day. Come and play!